GeoSpray. Sprays On. Stops Erosion. After application, GeoSpray forms a non-flammable crust that holds the substrate underneath in place, reducing the risk of contamination to nearby storm water drains and creeks. GeoSpray Original is porous and binds safely with the substrate. Advantages are that it is unaffected by the high winds that dislodge and tear geotextile products. Requiring no maintenance, it can handle storms and rain events because water drains through it. GeoSpray original can also be vegetated, eliminating the need for Jute matting and other TRM technology. GeoSpray Extreme does not allow for water penetration, making it ideal for highly dispersive soils, extreme weather events, extreme slopes, clean water drains and for use as a sediment dam liner. Developed by leading Australian soil scientists, the EnviroStraw range of products are proven to control erosion, revitalise soil and establish native vegetation anywhere. 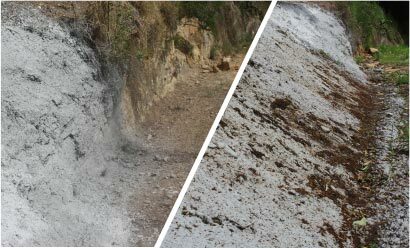 Use GeoSpray to control erosion in a range of situations.